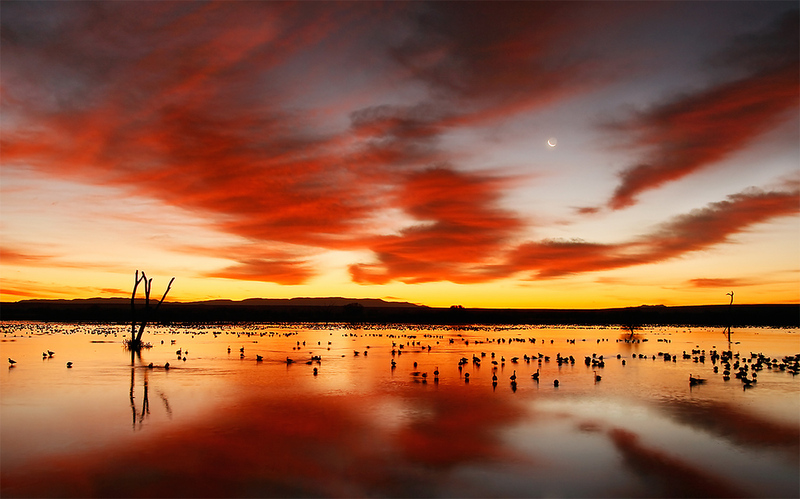 Canon EOS-1D X, EOS-5D Mark III, EOS-7D Mark II at Bosque del Apache NWR/Which One When and Why? It looks as if the sale of the 600 II featured in Tuesday’s blog post will soon be completed. There is still lots of great used gear listed here. Sometimes at sunrise you will want to go wide angle on the tiny ballhead with a full frame body. This one was 24-105mm at 24mm and a full frame body, either the 5D II or the 5D III. I will have five camera bodies with me for my nearly month long sojourn at Bosque: my two 1D X bodies (one sent via UPS Ground last week and one in a checked bag! ), my EOS-5D Mark III, my very own EOS-7D Mark II, and the loaner 7D II that Canon has allowed me to hang onto for a while. Which body will I be using when? To answer that question, I will take you through a typical day at Bosque situation by situation. The Canon 200-400 instantly became my favorite lens for pre-dawn work. It quickly gives me a focal length range of from 200 to 560mm. As I am generally not hurting for reach there will be a 1D X on the 2-4. My 70-200mm f/2.8L IS will be on my shoulder with the 5D III, again to allow me to get wider than I would with the 7D II. On some mornings, depending on the wind, I may have one of the wide angles with a full frame body within reach. For the most part the 7D IIs will stay in the car till at least 7:00am. 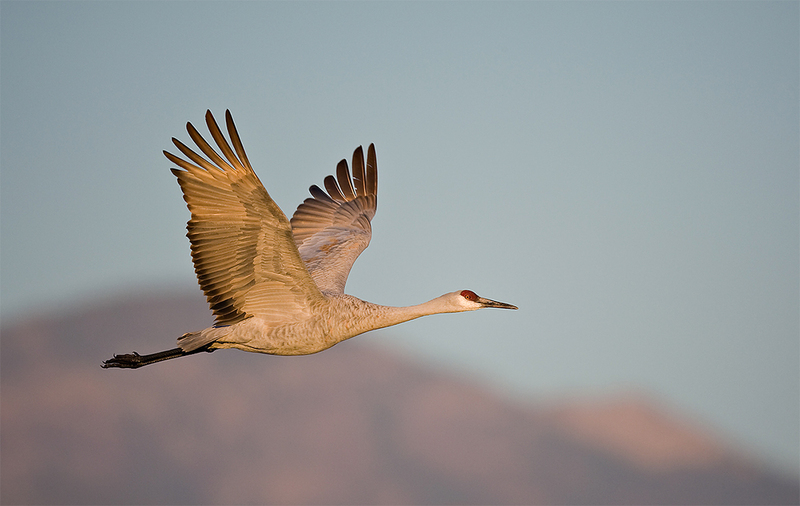 The 600II/7D II will often be much too long for the cranes heading for the farm fields. This one was 600 and full frame or 600 and Mark IV (1.3X crop factor). At the crane pools the 600 II with a full frame body is usually perfect. I opt for the 1D X over the 5D III here choosing frame rate over image size. But there is an interesting option that I am looking forward to trying: the 7D II on the 300 II (at times with the 1.4X III TC). Hand holding will always give you the edge over being on a tripod for flight and action provided that you can hand hold a given rig comfortably for a given period of time. The wind direction and the sky conditions determine whether I will go with a wider auxiliary rig on my shoulder. Usually not. The Bosque Site Guide (see same below) will teach you how and why to pray for winds with southern or easterly components in the early morning 🙂 And where exactly to be. Early in the season with the birds landing close to the road I may go with the 600 II/1D X combo. 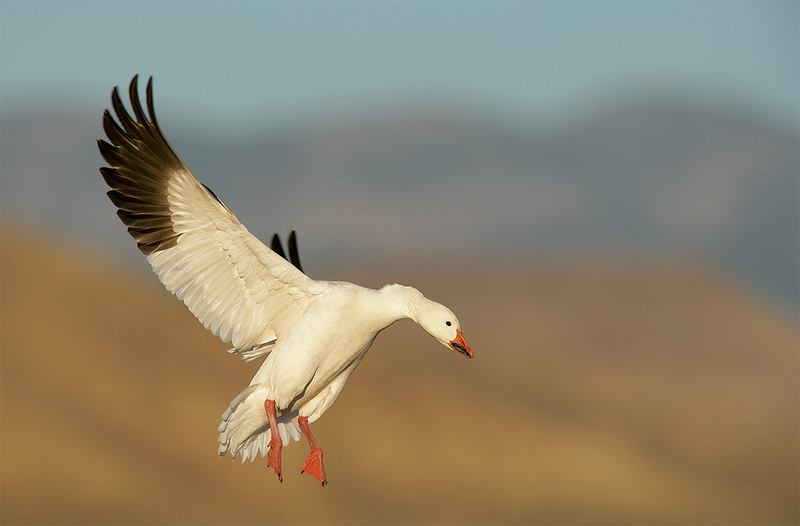 On rare occasion the birds may be landing close enough for an intermediate telephoto lens…. But those conditions are hard to come by. As the corn is knocked down farther and farther from the road I will surely go to the 600 II/7D II rig. Once blast offs are imminent, I will go wide with the full frame bodies, anywhere from fish-eye to 16-35 to 24-70 to 70-200. On clear days I will have a Singh-Ray ND or warming polarizer on each of those lenses. As I and we (denise and I) have a few days off, we will work from the car more than we do in a typical year. As most subjects are a good ways from the vehicle, I will have the 600II with a 1.4X III and the 7D II as go-to combo. That said, the 200-400 will be on the passenger seat with a 1D X on it. I brought an empty BLUBB and will fill it with about 12 pounds of WalMart Pinto beans. BFF Denise Ippolito will be in the back seat on the driver’s side. You can find me most days around 11:00am at K-Bob’s at the north end of town just past the Super 8. Early afternoons can offer a potpourri of photographic situations. I will choose my weapons based on what we find as detailed above. When I am focal length challenged I will reach for the 600 II, 1.4X III, and 7D II at least until proven otherwise…. All on the tripod of course. 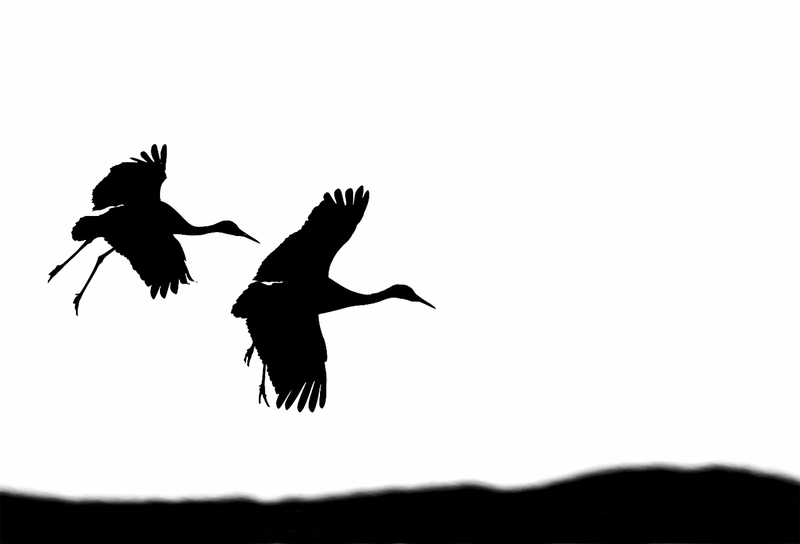 On a typical late afternoon at the crane pools you will want to go both very long and very wide. You get the idea by now 🙂 I am however, looking forward to using the 600II/1.4X III/7D II combo for the incoming crane silhouettes. AF will be faster than with the 600 II/2X III/1D X and I will have the advantage of being at f/5.6 rather than f/8; this will save me a full stop of ISO across the board. 16-35 or 24-70 on the Giottos MH 1302-655 BallHead (I call it the tiny ballhead) will rock on many evenings after most folks have gone home too early. When the color is intense and everywhere think wide angles and full frame bodies. Questions are welcome. Please remember that I will be flying most of the day and then setting up my hotel room and doing some micro-adjusting. But I will get to your questions asap. Please don’t think for one moment that I do not realize how blessed I am to be able to have five camera bodies at my disposal. I understand that that is not the real world for many. Note however, that many folks own both a full frame camera–one of the 5D series, as well as a crop body, something like a 1D IV, a 7D, or even better, a 7D II. I have added the 100-400II to the chart here. Bookmark this page and consult it often as it makes comparing different lenses and easy chore. The chart includes weight in both pounds and kilograms, MFDs in feet and inches and in meters, magnification, filter size, and the year of introduction. 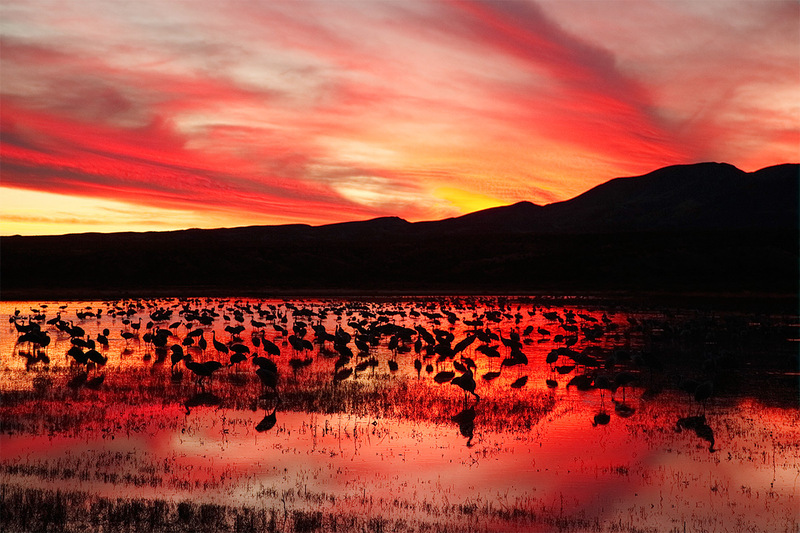 7 comments to Canon EOS-1D X, EOS-5D Mark III, EOS-7D Mark II at Bosque del Apache NWR/Which One When and Why? For folks that do not attend an IPT the purchase of the site guide will be a huge help and worth the investment. I have not been on an IPT but purchased the site guide, which gets the annual updates, and have used it extensively when I travel to the Bosque. Looking forward to this years updates and my upcoming trip in December. Hi, Artie. Welcome to the Land of Enchantment, or as my wife calls it, the Land of Entrapment. 🙂 Thanks for this very helpful blog. I’m getting enough experience with Bosque by now that your place/time/wind/light comments make sense to me! I hope you don’t mind my making a suggestion about camera bodies for those of us who are blessed, but not as blessed as you with respect to how many cameras we have, and that’s Canon’s wonderful 6D. It’s “full frame” and its image quality is every bit the equal of the 5DIII’s, and might even be slightly better. It can almost see in the dark as well. So it’s a wonderful camera for the wide shots you talked about, and for low light, and it’s much less expensive than the 5DIII. So for me, I find it a perfect complement for the 7D or 7DII. It’s not really a great action camera, although it’s more than good enough for some crane shots, but that’s why I’ll bring the 7DII. 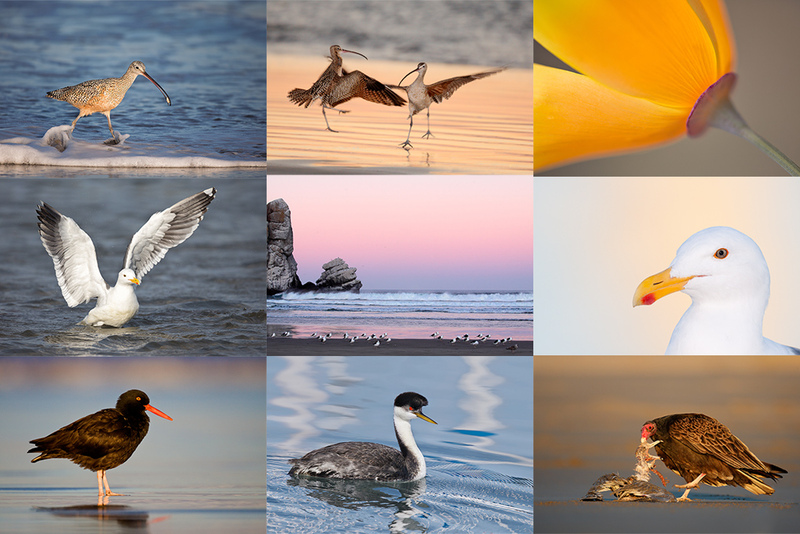 The 6D loves the 70-200 f/2.8L (any version) and the 24-70 f/2.8L lenses. I look forward to seeing you soon. As usual, beautiful pictures. A question about the caption on the first image, was it really a 600mm lens? All of the images are pretty spectacular! I will also have a variety of lenses and a full & crop body. Many thanks BFF. I have a spare 7DII that you can try….